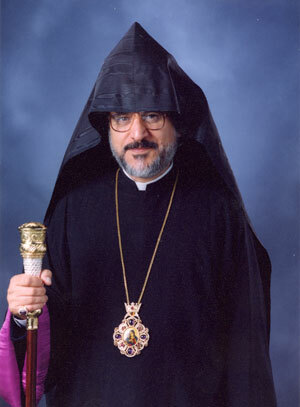 Archbishop Oshagan Choloyan was born in Aleppo, Syria. In 1960 he was accepted into the Cilician See’s Seminary in Antelias, Lebanon and was ordained a priest on June 4, 1967. As a newly ordained celibate priest, Archbishop Oshagan served as an assistant at the Seminary and he taught at the Mardigian School, serving two years as principal of the school. From 1968 to 1970 he attended the American University of Beirut, where he majored in history. From 1974 to 1978 he attended Princeton Theological Seminary where he majored in education and psychology, earning a Master’s Degree. Continuing his studies at Princeton, he earned a second Masters in the history of the church. In April 1980, he was appointed pontifical legate to Kuwait and the Arab Emirates. He was elevated to the rank of bishop in 1994. Since 1998, he serves as the Prelate of the Eastern Prelacy of the Armenian Apostolic Church of America. When elected Prelate of the Eastern Prelacy in May of 1998, Archbishop Oshagan Choloyan’s first priority was to visit each parish. This involved extensive traveling along the East Coast, the Midwest, and Canada, since in 1998 the Canadian churches were still under the jurisdiction of the Eastern Prelacy. The primary impression he received was the vital need to strengthen our parishes, and he immediately decided this would be a priority during his tenure as Prelate. Since 1998 he has spent considerable time on programs and events to help strengthen local parishes. Parish development became a popular and frequent topic during the National Representative Assemblies. The Executive Council went on the road, so to speak, taking their monthly meetings out of New York and into different regions. Seminars for boards of trustees were organized at regional locations. Most of all, Archbishop Oshagan listened to and examined the challenges and problems that were facing our parishes. The necessity for strong leadership became crystal clear in Oshagan Srpazan’s mind as he noted that those parishes with dynamic, educated clergymen at the helm, were the parishes that were thriving. When he came into office, a number of clergymen were approaching retirement, and some parishes were without a full time priest. He immediately plunged himself into the task of clergy recruitment, clergy training, and advanced education for clergy currently serving within the Eastern Prelacy. Largely due to his efforts, a number of funds were established specifically to fund programs for clergy recruitment and education. Today, nine years later, many of the parishes have a new generation of clergy serving, and only one parish and four outreach communities do not have a permanent clergyman. Thanks in large part to the efforts of Archbishop Oshagan, a group of far-sighted individuals have come forth with their financial support that provides scholarship aid to both seminarians on the road to fulfilling their calling, and ordained priests who are continuing their higher education. Archbishop Oshagan was born in Aleppo, Syria, in 1947, and was baptized with the name Manoog. He is the third of six children of Antranig and Marie (nee Kasbarian) Choloyan. His siblings are Sarkis, Simon, Vartan, Armen, and Ani. His two older brothers, Sarkis and Simon, died in 1998 and 1999 respectively, making Oshagan Srpazan the eldest of the surviving children. He received his primary education in Aleppo’s Haikazian School. His childhood in Aleppo in the midst of that community made up of survivors and their young families made a lasting impression on young Manoog and it could be said that many of his values and lessons of life were formed there in Aleppo. By 1959, young Manoog knew that he wanted to enter the Seminary and devote his life to the Armenian Church. “The church was such a constant and strong part of our early life in our home,” he says. He recalls how he and his brothers would “play church.” “My brothers would be Tbirs (sub-deacon), one would do the incensing (pourvar), the other the readings, and I would take the offering,” he recalls as he leans back in his chair and laughs. Manoog Choloyan was ordained a deacon in 1964, and a celibate priest on June 4, 1967, and given the new name Oshagan, by Bishop Karekin Sarkissian, who in 1994 as Catholicos Karekin II of Cilicia, ordained him to the Episcopal rank. In 1998, His Holiness Aram I elevated him to the rank of Archbishop. The teachers at the Seminary who made a lasting impression included Deacon Hrair Ashjian, Hayr Karekin Sarkissian, Kevork Kandaharian, Yetvart Dasnabedian, Yervant Pamboukian, Puzant Yeghiayan, and Moushegh Ishkhan. All of them were devoted Armenians and talented teachers. His classmates at the seminary included Minas Aznavorian (later Archbishop Zareh), who became and remained Archbishop Oshagan’s closest friend until his death in 2004. “We shared the same interests and always enjoyed working on projects together.” One of those projects became the ambitious task of a new translation of the Bible into western Armenian. After conferring with His Holiness Aram I, it was agreed that with the help of the Bible Society a new group of translators would be formed with Archbishop Oshagan leading. Rev. Dr. Manuel Jinbashian, who was the Bible Society’s consultant working with them, will continue to help the new team. The parts of the Old Testament that had been completed at the time of Zareh Srpazan’s passing are Genesis, Exodus, I and II Samuels, Psalms, Proverbs, Jonah, Song of Songs, Ecclesiastes, and many passages from the major prophets Isaiah and Jeremiah. Their New Testament translation in western Armenian has been published in several printings in Lebanon, Armenia, the United States, and Korea. The Book of Psalms is also in print. The New Testament and Psalms were rendered into Eastern Armenian by Professor Dikran Gyourjinian and published in Armenia several times. Many scholars in Armenia have said that it is the best translation for comprehension. In 1971 he received the rank of vartabed (doctor of theology) with the successful completion of his thesis, “Byzantine and Armenian Church Relations during the Cilician Kingdom,” by Bishop Karekin, who in 1983 as Karekin II of Cilicia elevated him to the rank of Dzayrakouyn Vartabed (Archimandrite). From 1974 to 1978 he attended Princeton Theological Seminary where he majored in education and psychology, earning a Masters Degree. Continuing his studies at Princeton, he earned a second Masters in the history of the church. During his student days at Princeton, he served the Prelacy in a variety of capacities, with the then Prelate Archbishop Karekin Sarkissian sending him from one place to another as needed, up and down the East Coast, the Midwest and Canada. Summers were spent at CampHaiastan as counselor and teacher. Today many of “his campers,” now grown with children of their own, remember the young, tall and slender Hayr Oshagan as a vibrant and dynamic presence at the Camp. During this period he used his excellent artistic abilities to design book covers, maps, and brochures for Prelacy publications. In May 1977, he was called upon to serve as locum tenens of the Eastern Prelacy for eight months prior to the election of a new prelate. The incumbent prelate, Archbishop Karekin Sarkissian, had been elected Catholicos of Cilicia in May and a new prelate was not elected until December. He shepherded the Prelacy until the arrival of Archbishop Mesrob Ashjian in January 1978. He continued to serve the new Prelate and the Prelacy until 1979 when he returned to Lebanon where he taught New Testament, Church history, and mathematics at the Seminary. In April 1980, His Holiness Karekin II appointed him pontifical legate to Kuwait and the Arab Emirates, where a growing number of Armenians had relocated. Facing this great challenge, Archbishop Choloyan organized the community, formed a diocesan structure, and in 1992 he was elected as the region’s first prelate. He served this community for more than 17 years, earning the love and respect of the faithful, until his election in May 1998 as Prelate of the Eastern Prelacy. His great pioneering efforts for that middle eastern community culminated with the consecration of the first Armenian Church in Sharjah, United Arab Emirates, in November 1998, which he attended at the invitation of His Holiness Aram I who consecrated the church—St. Gregory the Illuminator—amidst great joy and enthusiasm. “This church—the first Armenian Church in the United Arab Emirates—was consecrated on land donated by Sheikh Sultan bin Mohammed Al Qasimi, member of the Supreme Council and the ruler of Sharjah,” said Srpazan. When the Gulf war broke out in 1990, he was visiting the United States and was unable to find transportation to return. Although many of his friends in the States urged him not to return until the end of the war, he made every effort to find a way of returning and finally with great difficulty he was able to enter Kuwait and be with his community. After the war he spent a considerable amount of his time and energy reorganizing the community. 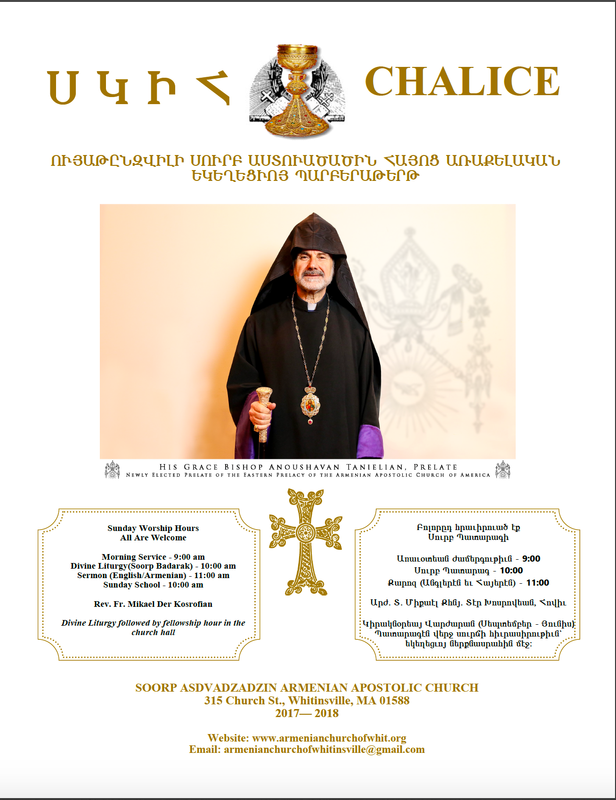 Archbishop Oshagan was assigned as co-chairman of the central committee for the 1700th anniversary of Christian Armenia. For several years, he traveled to Armenia on a regular basis to co-chair the meetings of the committee responsible for the worldwide events which included exhibits, pilgrimages, publications, and symposiums. “The 1700th anniversary should not be looked upon as a singular event that came and went, but rather an on-going process. It was a time of rejuvenation for our Church. Furthermore it was an opportune time to educate the world about the Armenian Church. It was the beginning of a worldwide awareness that should continue." His regular visits to Armenia have continued, to attend various meetings and to oversee the many Prelacy programs in Armenia. He meets with the staff in the Prelacy’s new office which last year was dedicated to the memory of Archbishop Mesrob Ashjian. During the 1980s Hayr Oshagan spent every summer—supposedly his vacation—in the United States working on this project. This was before the wide-spread use of computers. For him, each page of the hymn book meant hours of tedious work: preparing each page by hand, ruling lines, drawing notes, and pasting the words, syllable by syllable, in the proper position under the notes. Each page easily required a minimum of seven hours of intense handwork. The resulting five volumes is testament to his accomplishments as a musician and artist and, most of all, his devotion to the Armenian Church. He is continuing this project, with the use of modern technology, in memory of Zareh Srpazan. Archbishop Oshagan is now in his third term as Prelate of the Eastern Prelacy, having been re-elected in 2002 and 2006. He is always looking forward toward the future. “Our past, of course, is important,” he says. “We must know it, study it, learn from it. But, the past is not our capital. We must always focus on the future, with emphasis on the education of our children, encouraging them to reach their greatest potential, but never forgetting their roots. “When I assumed office in 1998, I remembered the Prelacy of the 1970s, and I saw the enormous progress that had been made. For this I credit the former Prelate, Archbishop Mesrob Ashjian, who served as Prelate for 20 years. Administratively the Prelacy was better organized and the programs offered were better implemented. On the one hand, I visited parishes where I was happy to see that children of active parishioners in the 1970s were now in leadership positions. On the other hand, I became concerned about the absence of many people who were quite active and who had disappeared from the scene. I kept wondering: Where are they? I do not want to lose a single person; everyone is important. Archbishop Oshagan acknowledges that some reforms must come to the Armenian Church. “We need to embark on a study of self-evaluation and begin a process of renewal. We need to explore issues like the language of the liturgy, the length of the liturgy, and ethical and moral issues that are so much a part of modern life. I am pleased that His Holiness Aram I is beginning this process,” he says. For the present, His Eminence’s message to every Armenian is this: “Do not just stand on the sidelines, come into the arena, be active, be a participant, always with the goal of building the Church and making it stronger for the glory of God."